Chris Ritter looks to pass. Ritter, who played at Northwestern from 2009-2013, signed a contract with the Chicago Fire, the club announced Monday. The Chicago Fire Soccer Club announced Monday it signed former Northwestern midfielder Chris Ritter. Ritter is the fourth “homegrown player,” a Chicago-area product that signs with the team, in club history. 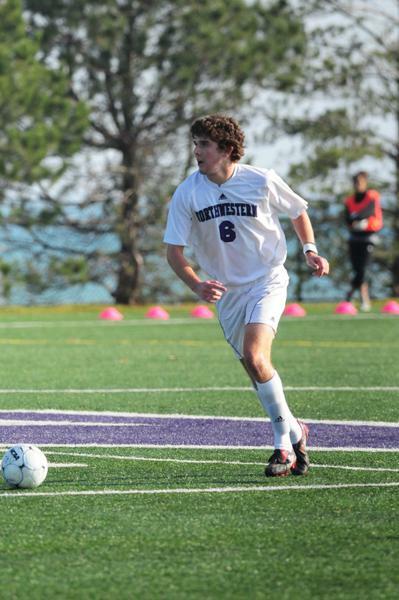 The Winnetka native and New Trier High School graduate had an illustrious five-year career at NU and will play with the Fire’s First Team, according to a Chicago Fire news conference this morning. Ritter started 18 games as a true freshman in 2009 and was named to the Big Ten All-Freshman team for his strong play. After an injury-shorted 2010 season in which he only played two games, Ritter returned in 2011 to post 4 goals and earn Second Team All-Big Ten honors. The midfielder had his best season as a senior in 2012, when he started all 23 games for the Cats and won Big Ten Defensive Player of the Year. Ritter continued his strong play as a fifth-year senior in 2013, posting five goals and five assists to end his career with 15 and 14, respectively. Coach Tim Lenahan said Ritter could have signed with the Fire last spring, but Ritter emphasized the importance of finishing his education before committing to professional soccer. Ritter also said he has been able to train with the Fire’s first team during the past few summers, an experience that gave him a taste of the new level of professionalism and time commitment playing with for the Fire demands. The midfielder leaves NU having been named to 2013’s All-Big Ten First Team and Second Team All-American in December, and said he hopes to put more NU players on the map in professional soccer with his signing. Lenahan said Ritter’s signing is good news for the program from a recruiting standpoint and that he hopes to develop a stronger relationship between NU and the Chicago Fire. Correction: A previous version of this story misquoted Tim Lenahan. The quote has been updated.